As any music fan knows, nothing kills a budding romance quite like learning that your new girlfriend/boyfriend has bad taste in music. 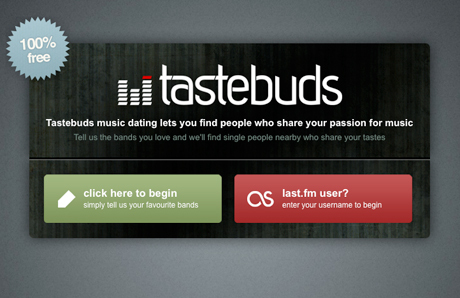 Luckily for the music snobs out there, a new dating website called Tastebuds aims to help those who are single and looking to find their musical soul mate. The website allows users to list their musical preferences and then matches them up with people who have similar tastes. Users can even sync their profile with their Last.fm account in order to keep prospective partners updated about what they're listening to. You can also add your Songkick account to let others know which upcoming shows you're planning to attend. Tastebuds was created by Julian Keenaghan and Alex Parish, who play in the UK band Years of Rice and Salt. According to someone who tried the site over at Jezebel [via AUX], "You have like two hours worth of icebreaker right there." If you head over to Tastebuds now, you can type in your three favourite bands and then start searching for users in your area with similar taste.